The Real Madrid central defender proved again that he is lethal from dead balls and moves into fourth place behind just Ronald Koeman, Fernando Hierro and Pirri. To suggest that Sergio Ramos is a divisive figure would be an understatement. He splits opinion better than anyone in the world of football, and while his form tends to fluctuate, there is little doubt that he is one of the most dangerous defenders in the world from dead balls. He proved that again on Saturday with a late goal to dash Barcelona's hopes of three points and the chance of moving to within a respectable six points of Real Madrid at the summit of La Liga. That headed goal moves him beyond Roberto Carlos and into sole ownership of the 4th highest goalscoring defending in La Liga history spot. He is still 20 goals behind Ronald Koeman on 67 goals, Fernando Hierro on 60 goals and Pirri on 52. 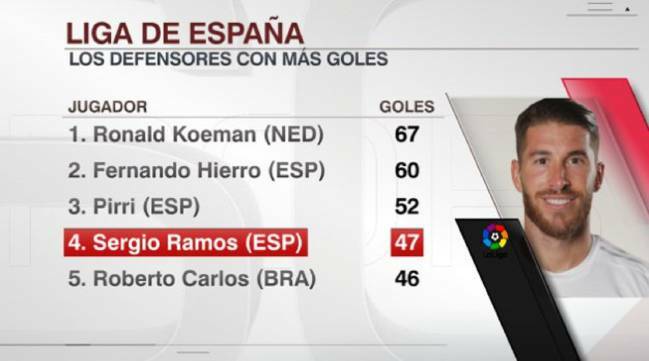 Ramos currently has 47.